My son started Pre-K a little over a week ago and it’s been nothing but chaos. Adjusting to a new sleep schedule, new school and entirely new routine has been a bit tolling on both of us. As a result I’ve been slacking a bit in the kitchen – yes I know, this food blogger has been a bit off of her game. Since I’m now up at the crack of dawn – 6 am to be exact, I’ve been tired throughout the day so my meals have been fairly quick as of lately. Don’t get me wrong, quick doesn’t mean that you have to sacrifice on taste and Barilla Pronto Pasta, which takes just 10 minutes to prepare, is exactly that! I love that there’s no draining involved so you can prepare an entire pasta dish in just one pot and it doesn’t sacrifice on taste; the pasta is perfectly cooked and al dente! I mean what’s not to love about that? 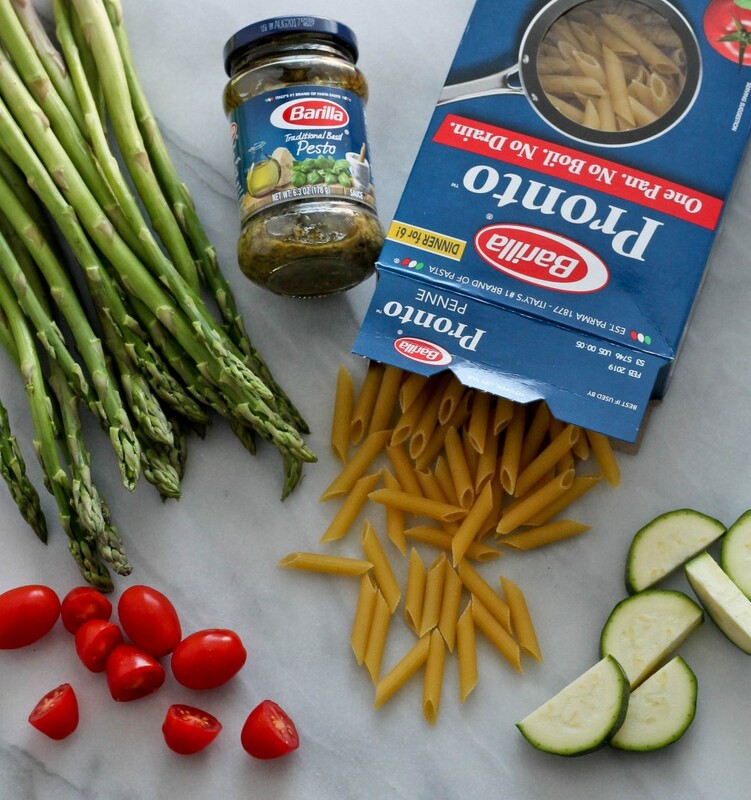 I grabbed a box of Barilla Pronto Penne and pesto sauce from Walmart along with a few vegetables with the intention of making a quick meal. 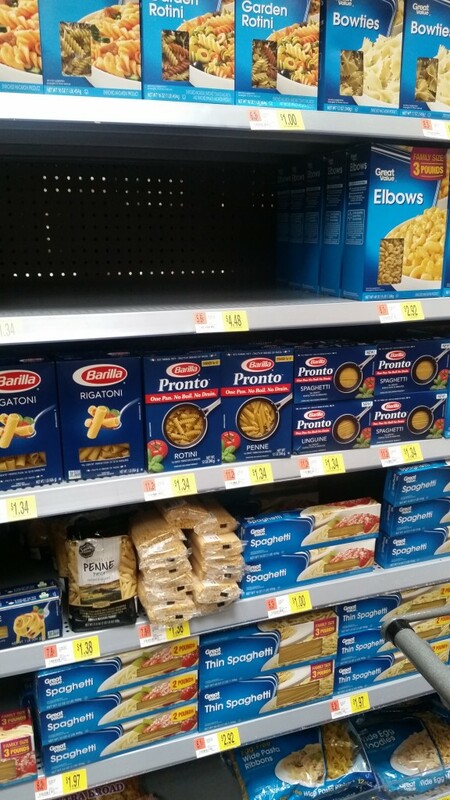 For every box of Barilla® Pronto™ purchased at Walmart between 7/31/2016 and 10/31/2016, Barilla® will donate 10 meals to kids in need through No Kid Hungry, up to half-a-million meals. 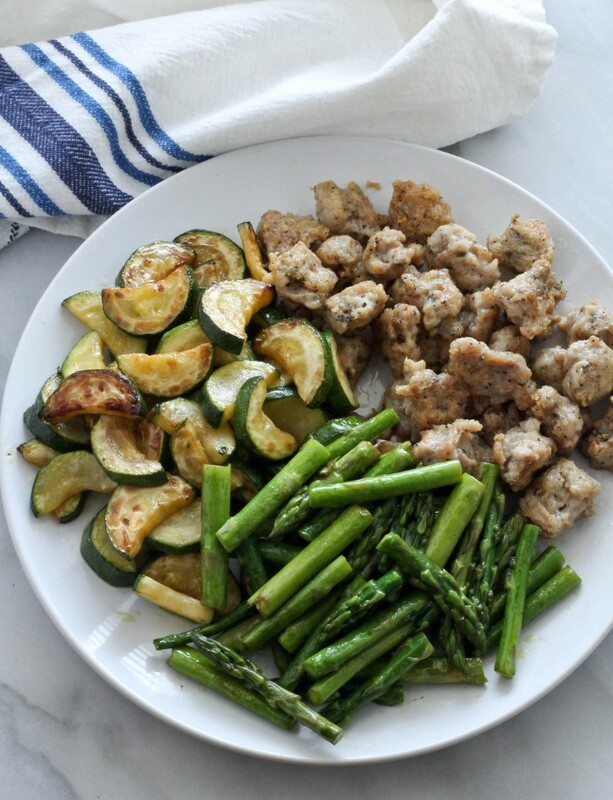 * I love meals like this because it’s quick and the best part is it’s loved by the entire family, picky four year old included! 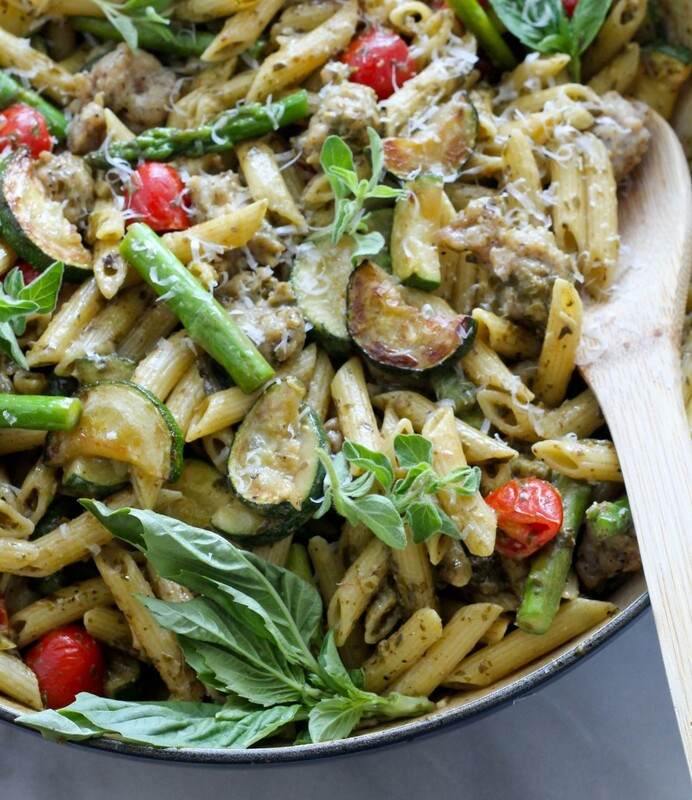 To make this dish I browned the chicken sausage and vegetables before cooking the pasta in the same pot. I used a combination of grape tomatoes, asparagus and zucchini but you can also use mushrooms or yellow squash. Cooking the pasta in the same pot in which I browned the vegetables infuses some of the flavor left in the pan from the sausage and vegetables into the pasta as it cooks. 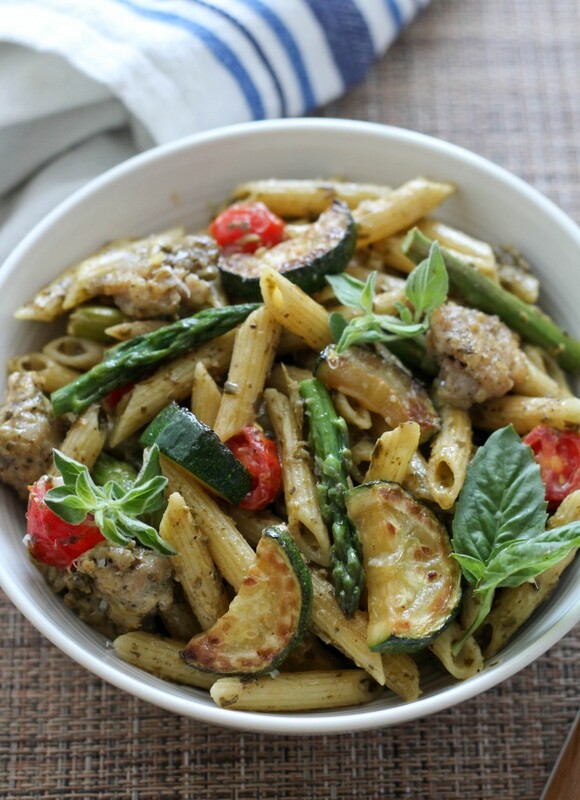 The basil pesto has a combination of authentic Italian herbs and cheese that adds amazing flavor to this dish. Even my picky son who dodges anything green loves this! So not only is it a quick dinner but also its sure to please the entire family. In a wide heavy bottom pot, add olive oil. Remove sausage from casing and place into hot oil and crumble into smaller pieces using a spoon. When sausage is brown, remove from the pan and place onto a plate. Next add zucchini and cook until brown on both side, about 6-8 minutes; remove from the pot and place onto a plate. Next add the asparagus the same pot and stir fry for about 2 minutes until it becomes bright green; place on a plate. Add Barilla Pronto Penne and 3 cups of chicken broth to the same pot and cook on high for 8 minutes. Add milk and cream cheese and cook for an additional 2 minutes. 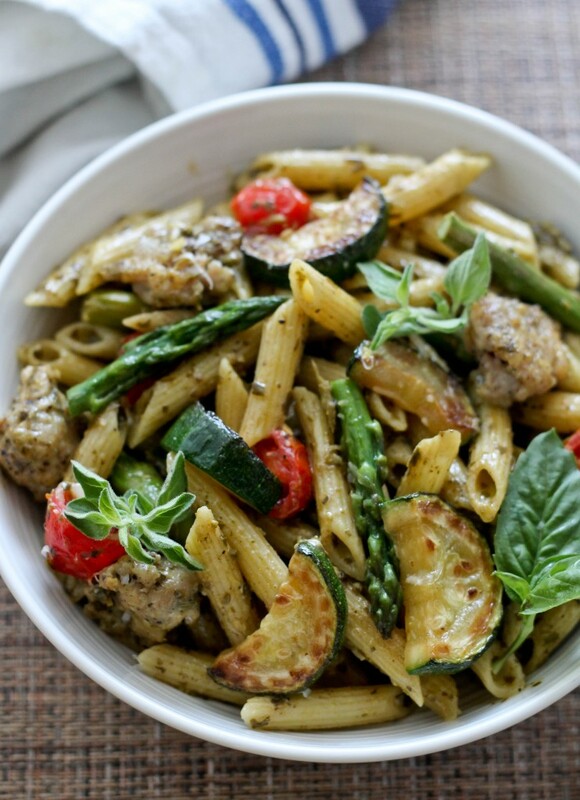 Once the cream cheese has melted, add the cooked chicken sausage, zucchini, asparagus, tomatoes, black pepper and pesto to the pasta and stir to combine. Cook for an additional 2 minutes to warm the tomatoes, then remove from the heat. Garnish with fresh basil and grated parmesan. Where did you get the chicken sausage? I’d love to try this recipe! Some supermarkets carry it or Farmer’s Market.